The Virtual Boyfriend or Girlfriend | OhGizmo! Ah, yes. Mankind has reached a new low, when instead of tearing yourself away from your Doritos-covered computer area long enough to wash and get a date, you’re offered the ability to date a virtual mate on a $40 trinket. 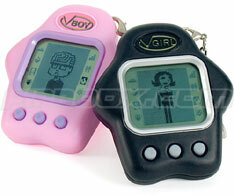 The Virtual Boyfriend and Girlfriend is a handheld toy inspired from the Tamagotchis. And like the toys, you’re given up to 8 different mates to keep happy through the occasional giving of gifts or compliments. We’re not sure what happens when you end up calling her by another name, but perhaps spending that $40 on some counselling might be more appropriate if you’re even remotely curious.